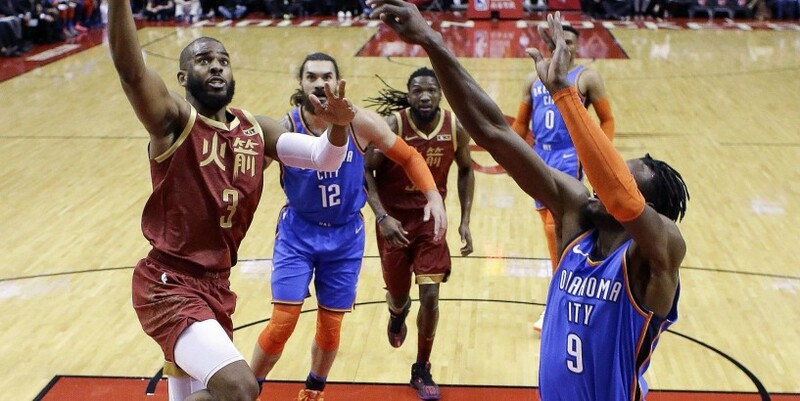 HOUSTON (AP) - Paul George scored 45 points, Russell Westbrook matched the NBA record with his ninth straight triple-double and the Oklahoma City Thunder overcame a 26-point deficit to beat the Houston Rockets 117-112 on Saturday night. James Harden led the Rockets with 42 points, reaching 30 points for the 29th straight game - two shy of Chamberlain for the second-longest streak in NBA history, but far behind Chamberlain’s record run of 65 games. Harden was 11 for 28 from the field, going 6 of 16 from 3-point range, and made 14 of 15 free throws. BOSTON (AP) - Montrezl Harrell forced two turnovers in the final two minutes and Patrick Beverley hit a pair of 3-pointers in front of the Boston bench night and retooled Los Angeles overcome a 28-point deficit. One game after the Lakers rallied from 18 points down to win in Boston on Rajon Rondo’s buzzer-beater - and six days after the Patriots beat the Rams in the Super Bowl - the Clippers turned the “Beat L.A.! chants” to boos. The Celtics collapse corresponded to the loss of Kyrie Irving, who left with a sprained knee in the second quarter, when the game seemed comfortably in hand. NEW YORK (AP) - Marc Gasol had seven points and six rebounds in his Toronto debut and the Raptors sent New York to its 16th straight loss. MILWAUKEE (AP) - Jonathan Isaac scored 17 points, Nikola Vucevic and Terrence Ross each added 15 and Orlando snapped Milwaukee’s six-game winning streak. The NBA -leading Bucks played without All-Star forward Giannis Antetokounmpo. He sat out with right knee soreness. They lost for just the second time in 14 games. ATLANTA (AP) - Kemba Walker hit nine 3-pointers and scored 37 points, Marvin Williams added 27 points and Charlotte beat Atlanta to snap a two-game skid. SALT LAKE CITY (AP) - Donovan Mitchell scored 23 points, Rudy Gobert had 21 points and 13 rebounds and Utah beat San Antonio. INDIANAPOLIS (AP) - Bojan Bogdanovic scored 23 points and Indiana beat Cleveland for its fifth straight victory. CHICAGO (AP) - Bradley Beal scored 31 points to help Washington beat Chicago in the first meeting between the teams since they swapped three forwards in a multiplayer trade. MEMPHIS, Tenn. (AP) - Joakim Noah had season highs of 19 points and 14 rebounds to lead new-look Memphis past New Orleans.